Many futurists believe that someday telecomputing will be the primary use for home computers -an integral part of every modem household. You’ve probably already heard the predictions about home banking, home shopping, “electronic newspapers,” tele-games, and on-line encyclopedias and data bases. Actually, all of these services are available today, though perhaps not in all areas, or in an affordable or mature form. But times are changing fast. All of our electronics/communications technologies seem to be merging, moving together toward a common center. Think about it: telephones, television, cable systems, satellite receivers, video cassette recorders, videodiscs, video motion and still cameras, home computers… everything is evolving toward some kind of “telectronic” supersystem that someday will fuse these now separate parts into an integrated whole. Will it really happen within our lifetimes? There are strong indications. TV sets are starting to come equipped with cable tuners and extra jacks for home computers, videogames, and other accessories. Wide-ranging information services aimed at personal computer users already are accessible with a local phone call in every major city of the United States. Similar systems in Europe are even more advanced. Some cable TV networks and banks in the United States are test marketing interactive systems using low-cost home computers as terminals. A few of the latest personal computers to be introduced, including those from Atari, Radio Shack, and Osborne, offer built-in phone modems as a standard feature. A new division of Atari, Ataritel, is working on a secret project that will unite home telephone and computer technology in a new way. Some people, instead of commuting to the city, work at home with personal computers or remote terminals tied into their employer’s computer over the phone lines. Video cameras are overtaking Super-B movie cameras in popularity. Still cameras that replace film with magnetic disks and which display their photos on TV sets will be available in a few months. For certain, there are social, as well as technological, trends which must be considered. So we’ll have to wait and see exactly how things develop. In the meantime, though, this exciting frontier is open to pioneers. It’s similar to the groundbreaking days of personal computing five or six years ago. Telecomputing today is still young. And you can help it grow of you’re new to the field of telecomputing, you’ll quickly discover that it shares something unfortunate with personal computing in general- telecom-puting consists of a few easily understood concepts obscured by thickets of thorny terminology . Two or more computers can be hooked up to each other with wires. With the proper programming, virtually any computers hooked up in this way can exchange virtually any kind of information. read or hear about telecomputing consists of extensions (complications) of these two basic concepts. The “proper programming” is often the hard part. The computers may not be normally compatible with each other. However, you probably won’t have to worry about this. programs to cover all the standard situations you’re likely to encounter are already written. These programs act as interpreters. They even make it possible for seemingly incompatible computers, such as Commodores, Ataris, Apples, TRS-80s, and others, to communicate as easily as United Nations diplomats. Now, let’s enlarge upon these concepts. To communicate through ordinary telephone lines, a computer requires a device called a modem. “Modem” (rhymes with “load ’em”) means “modulator-demodulator.’ When two or more computers are communicating over the phone, each computer requires its own modem at its end of the line. The modem is connected between the computer and the phone line, and it allows the computer to send/receive information to/from the other computer. When you are sending, the modem takes the data in the form of electronic signals from the computer and converts it into audio tones. Then the modem sends the tones through the phone line. These tones, if you hear them (sound like very fast Morse code). When you are receiving, the J” modem takes the audio tones, sent by the other computer’s modem and converts them back into the electronic signals that are understood as data by your computer. This process may sound familiar. That’s because it’s very similar to the way the computer saves programs and other data on the cassette recorder. During a SAVE, the computer’s output) is converted to audio tones which, are sent to the recorder and recorded on tape. During a LOAD the audio tones received from. 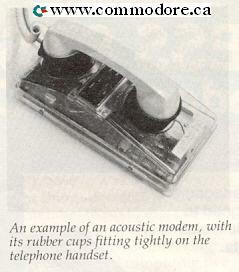 An example of an acoustic modem, with its rubber cups fitting tightly on the telephone handset. The recorder are converted back into the original information. A modem works the same way, except the tones and speed of transmission are different. And, of course, the information is being sent not to a nearby cassette recorder, but to another computer which can be as far away as the furthest telephone. There are two general types of modems for personal computers: acoustic and direct-connect. Acoustic modems are easy to spot because they have two rubber cups which fit over the telephone handset’s earpiece and mouthpiece (see photo). The rubber cups must fit tightly to keep outside room noises from interfering with the audio tones. Direct-connect modems do not use rubber cups. Instead, they bypass the handset altogether and connect directly into the telephone. 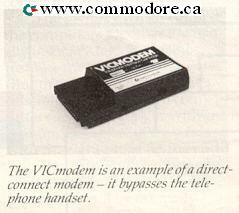 Commodore’s VICmodem, the most popular modem for the Commodore 64 and VIC-20, is of this type. The VICmodem is a cartridge that plugs into the rear of the computer, and a cord links it with the telephone (see photo). Direct-connect modems are often preferred to acoustic modems because they are less vulnerable to noise interference. They are the best choice when the modem is operated in a less than-quiet environment. Until recently, acoustic modems were more popular because of their lower cost. But new technology has made some direct-connect modems less costly than many acoustic models. The VICmodem is widely available for under $100 (see review in this issue). Equipped with a modem plugged into a telephone, a computer needs only one more thing to be ready for telecommunicating: the “proper programming” mentioned above. This program is usually referred to as terminal software. In effect, it turns your computer into a remote terminal of the distant computer. Your computer is more or less “disabled” as an independent computer and becomes a peripheral or external device of the other computer. Everything you type on your keyboard appears not only on your screen, but on the other computer’s screen as well. And everything typed on the other computer’s keyboard likewise appears on your screen. Terminal software completes the communications link established by the hardware the computers and the modems. It works with the modem to translate the data which is sent and received. If the two computers are normally incompatible with each other -say, if a Commodore is attempting to communicate with an Atari the terminal program acts as an interpreter to resolve the differences. With the right terminal software, you can communicate with almost any computer. This includes not only other personal computers, but much larger machines as well. College students can program the university’s mainframe or minicomputer from their dormitory room, using an inexpensive home computer and modem as a remote terminal. Employees can work at home, accessing their business’s computer in the same way. This makes some of the great speed and power of mainframe computers available almost anywhere. All terminal software is not programmed equally, however. Some terminal programs have features which allow you to do more than-others. One of the most powerful features is upload/download capability .This permits you to send and receive files. Files can be anything from written letters to actual programs. For instance, let’s say you want to share a new program you’ve written with a friend across town or across the country. You could mail the friend a cassette or disk. Or, if you both have modems and the proper terminal software, you could send it by phone. You would call up your friend, establish the telecomputing link by activating your modems, and “upload,” or send, the program. At the other end of the phone line, your friend’s computer and modem would be “downloading” the file. Upload/download is like overpass/underpass; it depends upon your point of view. The sender uploads as the receiver downloads. Usually, the terminal software loads the file off disk at the uploading end before sending it through the modem. At the downloading end, the file is then saved on disk also. It’s possible to use a cassette recorder at one or both ends, but the relative slowness of cassettes becomes a big disadvantage, especially when a long-distance phone link is involved. Exchanging tiles also requires lots of memory .Each computer must have enough memory to hold both the terminal program and the file. This should be no problem with the Commodore 64, but the VIC-20 needs memory expansion. Note that even two computers which are normally incompatible can exchange files in this way. An Apple user could upload a message or a program to a Commodore user, for example. But remember, only the phone link has been standardized; the programs remain incompatible. Still, you might be able to modify the program to work, and it would save lots of typing. What else can you do with a modem? One popular activity is calling up bulletin board systems (BBS). A BBS is a computer with an auto-answer modem that offers some sort of service, either to anyone who calls, or to a select group of people who know the password. Most bulletin boards are operated by user groups, individual hobbyists, computer shops, or other organizations. A computer is equipped with an auto-answer modem and is left on during certain hours, some- times 24 hours a day. When you call, the modem automatically answers the phone and sends a steady tone. This signals you to activate your own modem, setting up the link. Once “on-line,” the BBS usually displays a welcoming message and menu of choices on your screen. The choices depend on the BBS. It may be a local user group BBS that offers members the latest news and library programs for downloading. Or it could be a machine-specific BBS with news and programs for users of that particular computer. Some bulletin boards cater to other special interests, such as amateur radio or science fiction. Many allow you to leave mes sages for other callers to read. There are even dating services and “X-rated” bulletin boards. There are also a number of Commodore-oriented bulletin boards. For a listing of phone numbers and hours, see “Commodore Bulletin Boards” in this issue. Almost all of these bulletin boards are open to virtually anyone. A few, however, require passwords known only to members of a certain organization. Besides these privately operated boards, there are also commercial information utilities which, in effect, are giant bulletin boards themselves. Instead of operating their systems with small personal computers, these utilities use vast banks of minicomputers and mainframes which allow hundreds of callers to be on-line at a time. They offer wide varieties of services to their subscribers, who pay an hourly connect fee. Many of these utilities are specialized data bases aimed at business people and professionals such as scientists and lawyers. They can be quite expensive -up to $300 an hour. The most popular telecomputing utilities for personal computer users are the CompuServe Information Service and The Source. Some others are the Dow Jones Information Service, Delphi (run by General Videotex Corporation), and the Dialog Information Service. Connect fees for these utilities start at about $5 an hour if you call in the evenings or on weekends and holidays. “Prime time” (business hours) costs more. If you live in a major metropolitan area within the United States, you can usually reach these utilities with a local phone call. The utility leases long distance phone lines from each area to its central computers, and the phone charges are included in the hourly connect fee. In some smaller cities and rural areas, you’ll have to reach the utility through a long-distance network such as Tymnet, whose charges (about $2-$3/hour) are added to the hourly fee. It would take a whole magazine to list the services offered by the information utilities. There are encyclopedias, newspapers from all over the country, business news and stock reports, Associated Press dispatches, the latest sports scores, marine and aviation weather reports, electronic mail, special interest groups, and even party lines and telegames (see related articles in this issue). Some modems or terminal programs include a free subscription and some free connect time on one or more of the information utilities (the VICmodem comes with these bonuses). This is an excellent way to find your way around and get acquainted with what’s available. If you want features such as upload/download, check before you buy. VIC-20 users; especially, should be sure they have enough memory to run the proper, terminal software. Phone lines can be temperamental. The telephone system is a marvelous thing, but it, remember, it’s a 19th-century, invention that was originally designed for voice transmission, not data communications. A good connection is essential for telecomputing. Interference which is unimportant for voice purposes can easily confuse a modem. Unfortunately, telephone companies can be difficult to deal with on these matters. If you suspect a phone line problem, bolster your case by verifying that your computer/modem/ software combination works on another line, .Sometimes you can solve an interference problem by moving the TV away from the modem and telephone. TV sets generate strong magnetic fields. If your computer is not near a telephone, you’ll have to install an additional phone jack or use a phone extension cord. Try the extension cord first; it’s cheaper. But if the additional wire causes interference problems, you may have to resort to another jack.